On Saturday, I co-taught another origami jewelry workshop at the library with Dawn and Brian Jackson of the Albuquerque Origami Society. We made origami heart earrings and barrettes. With participants (of both sexes!) ranging in age from middle school to elderly, I was a bit worried about how everyone would handle folding the miniature hearts—but all of the earrings or barrettes turned out beautifully! I think it was the most successful origami jewelry class so far! In fact, since a number of other people expressed interest in the class but were unable to come on Saturday, we have decided to repeat the workshop on Tuesday, February 8, from 4-6 p.m.
See how well the origami jewelry turned out? Come to the next workshop to make some special gifts in time for Valentine’s Day! Zoom Away is the second book in the enchanting Zoom Trilogy, by Tim Wynne-Jones and illustrated by Eric Beddows. This book won the Amelia Frances Howard-Gibbon Illustrator’s Award (1986), which is awarded to an outstanding illustrator of a children’s book published in Canada. I projected large images from the book and read the story with the help of my puppet, Zoom, who chimed in with lots of comments and additional details. Zoom is summoned by his friend, Maria, to accompany her to search for his elusive Uncle Roy. “Dress warmly!” she tells him. She shows him a map of the North Pole and, as they climb the increasingly snow-covered stairs in her magical house, Zoom straps on his ping-pong paddle snowshoes. As they go down a long wintry hallway lined with monumental Snowmen, they can hear wolves howling, and Maria suggests that they sing a little song. Eventually they come to a tiny door marked “Northwest Passage” and Maria tells Zoom that she will meet him on the other side. After toiling through a long, scary tunnel, Zoom emerges into brilliant sunshine at the ice-covered North Pole. After ice skating for a while, he begins to explore. He notices a distant ship frozen in the ice, and, looking closer with his spyglass, he makes out the name of the ship: The Catship. It’s his Uncle Roy’s ship! Zoom goes to investigate, and soon he discovers a note from his Uncle Roy. He and his crew have gotten away to warmer climes, but he will be back to retrieve his ship. Zoom is disappointed that he has once again missed meeting his Uncle Roy, but Roy has left him his captain’s whistle, and Maria appears to take him home. We had a large group, which included a number of visually impaired children and their teachers (who came unannounced). Fortunately our snowman bodi-puppets were perfect, with their simple circle and cone shapes and different textures (construction paper (hat, eyes, and nose), poster board (body), paper plate (head) felt (scarf and mittens), and foam wrap (arms). Cool After School: Hello, Fruit Face! For my first Cool After School program after my holiday break, I featured the book, Hello, Fruit Face! The Paintings of Arcimboldo, by Claudia Strand. …and of course I could not resist showing off the edible version of The Statue of Liberty that I made quite a long time ago. 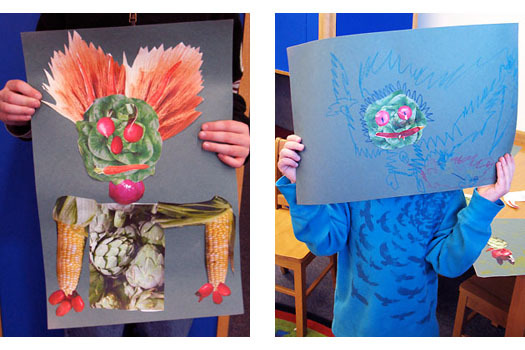 For the class, I had printed out images of various vegetables, and the kids (and at least one of the parents!) had a blast composing their grotesque self-portraits. They came up with highly individual ideas, including pop-up elements. I was impressed with the results! I discovered that an exhibition at the National Gallery of Art had just closed a few days before this class. ﻿Arcimboldo, 1526–1593: Nature and Fantasy will next be on view at the Palazzo Reale, Milan, January 27–May 8, 2011. It features a monumental sculpture by Philip Haas of Arcimboldo’s portrait, Winter. I had a couple of weeks off from story times after the holidays, and I chose Eugene Field’s poem, The Duel, for my first Movement & Music program. I love the Janet Street’s illustrations for The Gingham Dog and the Calico Cat, but I managed to leave the book behind that day. However, the story is ripe for dramatization, so I did a quick Google image search for gingham and calico fabric, a Chinese plate, and a Dutch clock. 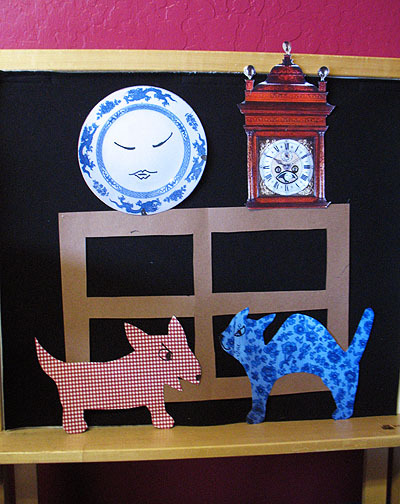 I cut out the dog and cat, an attached a construction paper window and the old Dutch clock and the Chinese plate to the flannelboard. I printed out an extra sheet of the gingham and calico images, and cut them up in little pieces. During the fight, I had the impromptu puppets falling down behind the hassock that forms the front of the stage, and one or the other would occasionally fly up into view along with shreds of gingham and calico paper. The kids (and their parents) loved it!